Stephen O'Donnell says being in the Scotland squad is "the icing on the cake" after an impressive first season at Kilmarnock. The right-back, 26, joined the Rugby Park club last summer and helped them finish fifth in the Premiership. O'Donnell could make his international debut against either Peru or Mexico. "The only target I'd set when I signed for Kilmarnock was to play, enjoy my football and finish in the top six," he said. "Fortunately enough, we managed to do that, and the Scotland call-up is just the icing on the cake. It's nothing I could even have dreamed of, so I'm very excited. "I know the call-up is for me personally but Kilmarnock this season have been outstanding as a team and since the manager Steve Clarke has come in, he's emphasised that. "Obviously I'm delighted that it's myself that's coming but it could have been a number of us that got the call." Alex McLeish's side take on Peru in Lima in the early hours of 30 May (UK time) before Mexico host Scotland on 3 June. O'Donnell is one of nine uncapped players in McLeish's squad, with seven-times capped Callum Paterson his probable rival for the right-back slot. "There's plenty of talent in the Scotland squad; this squad, previous squads, future squads," said O'Donnell. "I just need to try to take this opportunity, show the staff what I'm capable of and if that leads to future calls, I'll be delighted. "Ryan Fraser, Callum Paterson, James Forrest have all played right wingback and they've all been brilliant, so I'm not naive enough to think I should be knocking on the door, but hopefully if I do myself justice over here, I'll have half a chance. "Every player who has come on this trip wants to try to make a name for himself and show everyone in the nation that you're capable of performing at the top level." O'Donnell's Killie boss Clarke, himself a right-back as a player, featured six times for Scotland and made more than 500 league appearances across spells at St Mirren and Chelsea. 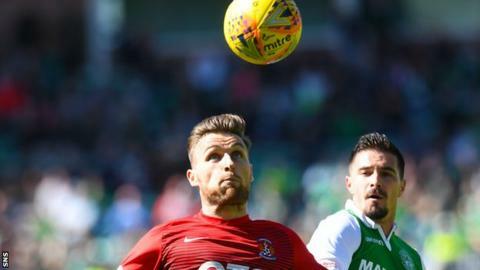 "I've been fortunate that a few of my managers have been defenders, including Jackie McNamara at Partick Thistle," added O'Donnell, who scored four goals this season. "The great thing that Steve Clarke has brought to my game, that I was lacking, is that I'm now a bit calmer. I get worked up quite a lot. Because I care, it's not necessarily a bad thing. "But I get worked up and he's at the side of the pitch at half-time and full-time and he's just a calming influence. You look at him and nothing bothers him. Well, the occasional bad refereeing decision, but that bothers all of us. "I've a long way to go, still, but I'll be working on that next season."